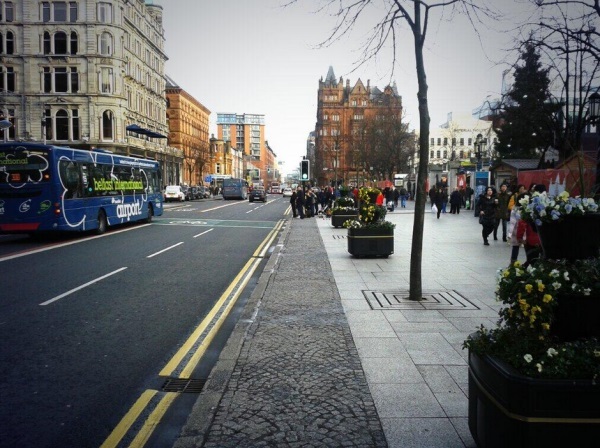 That was the simplest expression of what Ride On Belfast is about – people riding bicycles in Belfast for their own reasons, whether being the most practical way to work, for the school run, for their health or just the enjoyment. It’s not a protest, it’s not ‘taking back’ the roads, it’s not causing aggro to others – just riding a bike. But to make this year really special, we needed some new, innovative tactics..
Belfast is used to long arid summers, heatwaves lasting months and emergency air-drops of Mr Frostie supplies, but Fréd and his goons needed to be sure that precipitation wasn’t going to affect Ride On Belfast. There was nothing for it – with a brass neck, we tweet-bombed all of the finest weather presenters on local television, and Frank Mitchell too. And by jove, the BBC crew got into the spirit, with Angie Phillips retweeting, Barra Best tweeting his own predictions, and the fabulous Cecilia Daly (the new darling of Belfast cycling) going the extra mile..
And so, the day before Ride On Belfast gathered, we got our first official ‘national’ weather forecast! And as it turned out, the weather was just about perfect on the day.. Perfect morning for a #RideOnBelfast – Gasworks, 8am. See you there! 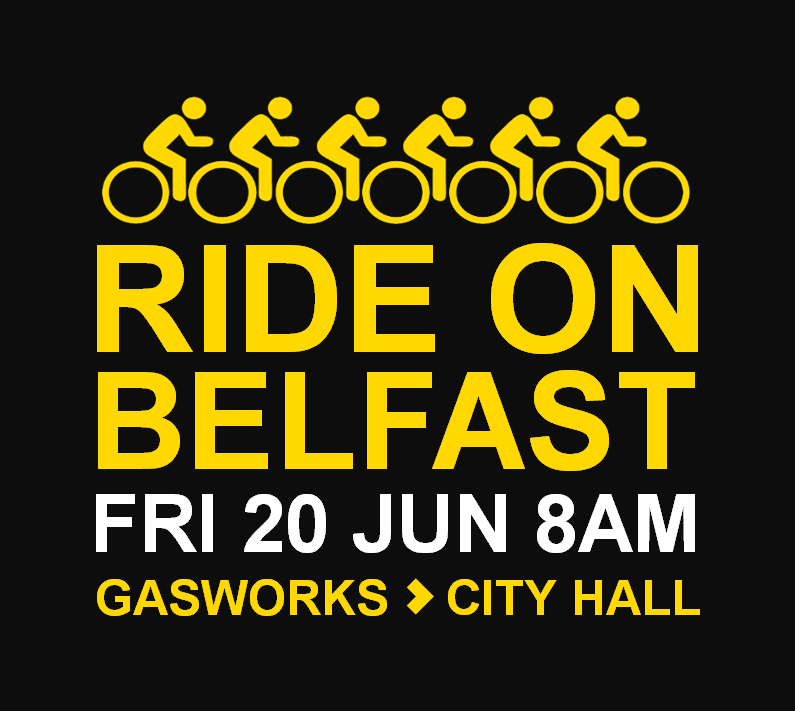 It's #RideOnBelfast day! See you in half an hour! This was a most welcome nod to active travel, and hopefully will give Translink and DRD pause to consider trialling this over a longer period. The gathering crowd was impressed to see Northern Ireland’s Transport Minister Danny Kennedy ride into the bunch with his new Cycling Unit in tow. Regular cyclist and MLA Sammy Douglas also joined in. Under severe pressure from hungry commuters, the peloton set off a little earlier than planned. With a tight first turn from the Gasworks green onto the road, the Minister seized his opportunity and put in a devastating early kick. This split the peloton at the Ormeau Road crossing, and the breakaway group was never caught again. 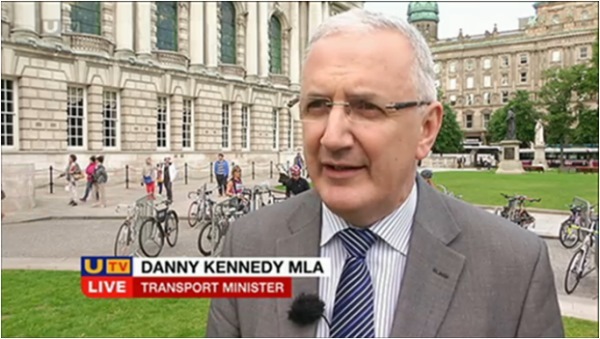 Apparently, Danny Kennedy’s sprint finish down Donegall Place was a phenomenal sight. This year Ride On Belfast took an extended trip around Belfast, leading to an iconic roll down Royal Avenue towards the City Hall. The PSNI officers took a relaxed back seat this year, yet the busier junctions were taken with ease. Notable pinch points (again) were the length of time to traverse Shaftesbury Square (not great for cycling at all) and the bus lane at Great Victoria Street (still not great for buses, never mind cycling). Holding the outside lane along Carrick Hill worked to control what was expected to be the busiest and fastest traffic of the ride. The traffic-restricted streets of the city centre were a joy. After the last year with Máirtín Ó Muilleoir as Lord Mayor, Belfast has fallen in love with the selfie. As well as people just taking them for the craic, See.Sense also ran a competition for the best selfie taken by their stand at Belfast City Hall..
A huge thank you again to Travelwise and Belfast City Council for providing a free breakfast at the Bobbin Cafe (and the new option of a free coffee at Javaman) for those who completed Ride On Belfast. The City Hall grounds became a sea of bicycles for the morning, while local cycle lighting tech firm See.Sense showed off their wares and PSNI bike officers were busy security-marking bicycles for the punters. Inside the City Hall, the breakfast queue stretched out the door (which is testament to the rise in participation at Ride On Belfast) and we’re all grateful to the Bobbin staff for coping under severe pressure. Counted 150 on arrival, more came later "@thefredfestival How many bikes at city hall this morning? pic.twitter.com/EjPf75JgV1"
Great turnout at the #BikersBreakfast this morning, wonderful to see so many cyclists out to enjoy a cycle, a coffee and some breakfast! Straight after the event, our Twitter traffic was enough to set #RideOnBelfast trending locally – maybe next year “sectarianism” can be beaten by cycling? Little steps..
Paul Reilly brought the UTV cameras down to see what all the fuss was about, and importantly set the day in context with a reminder of the shocking scene of a child’s bicycle under a truck at Ballyhackamore the day before. Along with the tragic death of 5 year old Conor O’Neill 9 days before, Bike Week had a strong focus on road safety and infrastructure improvement this year. Ride On Belfast turned out to be a really positive, fun event and this was reflected in social media comments directly afterwards. We had new cycling commuters, people trying out cycling for the first time in years, as well as familiar faces. While we couldn't participate in #RideOnBelfast, two CAI staff members huffed and puffed their way into the office in N'breda today! Really enjoyed #RideOnBelfast this morning, meeting like-minded folks and being part of a mass cycle was a great experience. Good chat today with @sammydouglasmla at the #RideOnBelfast – a real honest to goodness cyclist. Loves the bike. 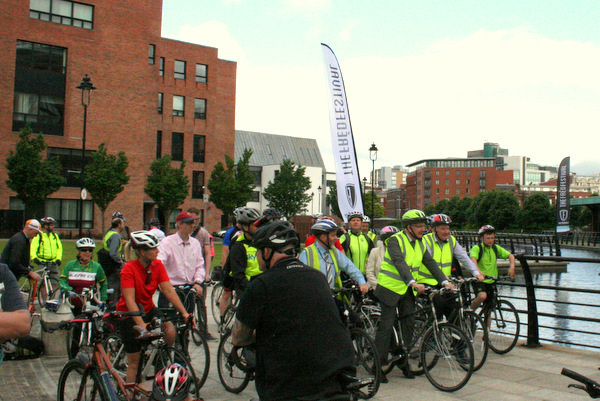 #RideOnBelfast is the irish for #CriticalMass Enjoy! Cycling with strangers #RideOnBelfast such a nice bunch. Thanks for the lovely @thefredfestival seat cover for my Brooks! In the end, the various breakaway groups which started from the Gasworks numbered 150, with close to 200 registered for the bicycle breakfast at City Hall. Overall that was a doubling of participation from 2013, which is a credit to all involved – The Fréd Festival, Travelwise (DRD) and Belfast City Council.